At Transform Consulting Group, we know your work is important. We also know your time and resources can be limited, regardless of the role you play at your organization. We work with many organizations and programs who are stretched thin working on the front lines with individuals and families to make an impact. We understand that the behind the scenes marketing gig is rarely your top focus. We also see too many programs fail when they see marketing as a luxury instead of a necessity. The reality is, you need to market in some capacity if you want to grow your organization and continue your good work. At TCG, we’re here to help. 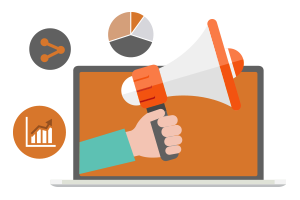 We want to make the process of laying your marketing foundation as easy and painless as possible. That’s why we’re continuing with our Marketing 101 blog series. We covered tips for branding here, best practices for enhancing your social media here, and this blog will unpack 6 simple ways to improve your website. Your clients expect it. Six out of ten consumers expect brands to provide online content about their business, and more than half go directly to the website for information. You control the message. You don’t always have power over what people say about you on social media or on other platforms, but on your website, you are in charge of the narrative. This is your space for telling your organization’s story. If you don’t have a website, check out free sites like WordPress, and get something posted as soon as possible! You don’t have much time to capture attention online. The average page visit lasts less than a minute. This means you must grab the viewers’ attention quickly, and give them reasons to stay on your page. Your homepage should clearly state who you are and who you serve. You can’t necessarily give away all the information on the first page, but a visitor should be able to gain some basic understanding of your organization during that first glance. Take a look at our TCG homepage. Without even scrolling, visitors can click on a testimonial video and see our mission statement front and center. Whenever possible, use active voice when writing the narrative on your website. Passive sentences end up being wordy and vague. Active voice encourages active readers. You want readers who are engaged and who, hopefully, act! 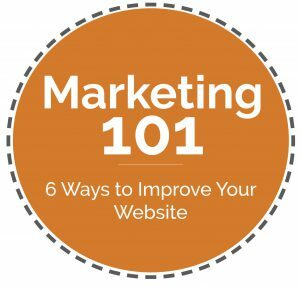 Using active voice also helps increase your SEO (search engine optimization – see more in tip #5). People want to know you, like you and trust you before they work with you. Show behind the scene glimpses of what goes on at your organization and your culture. Use conversational language and avoid technical terms that aren’t approachable. At TCG, we’re proud of the culture we have created, and we want to showcase it! 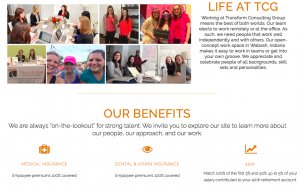 One way we do this is by highlighting our perks on the career page. We also have individualized bios for each team member. 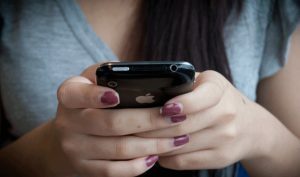 Nearly 60 percent of online searches happen from a mobile device. What does this mean for you? Your website needs to be just as compelling whether someone visits on their desktop or cellphone. Here are some quick tips for making your site mobile friendly. However, the biggest thing to start doing now is test it. Have your staff members pull up your company’s site on various devices (phones, iPads, laptops of different sizes, etc.) and see how it looks! You can take courses and spend hundreds and thousands of dollars trying to learn how to make your website searchable, or increase search engine optimization (SEO). Publish Relevant Content: Quality content drives your search engine rankings. Create content that is specific to your audience. Identify keyword phrases for each page by thinking through how your readers might search for that specific page. Update Content Regularly: Search engines like to see regularly updated content. This shows your site is relevant and your organization will pop up higher in searches. As with any marketing strategy, spend time assessing if your efforts are working! We use Google Analytics to track monthly data on our website. The setup for Google Analytics is free, but it looks a little different depending on your website host. Here is a tutorial to get started. How many people visit your website daily? How many new or returning visitors come to your site? How many pages are people looking at when they visit your site? What cities are your visitors from? How are your visitors finding you (on social media, organic searches, etc.)? You can also show side-by-side comparisons of different months or weeks to gain a good understanding of if you’re heading in the right direction. This is a great method for tracking progress and areas to improve! 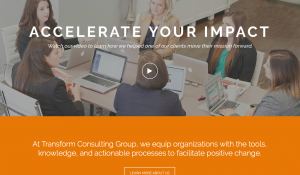 At TCG, we want to help you accelerate your impact – whether that’s with your marketing efforts or through our other services. Contact us today and learn more!